By taking into account RIM’s leaked devices so far, we have a brief idea as to what they have in store for us. And now, it’s the BlackBerry Bold Touch a.k.a Dakota and the Monza i.e. the GSM version of the BlackBerry Monaco. 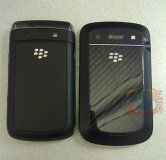 Some days ago, we saw the BlackBerry Torch 2 being leaked on the web, which is now followed by these two handsets. The BlackBerry Monza 9860 a.k.a Torch features a 3.7-inch WVGA display, a 5MP camera with 720p video recording capabilities, a 1.2 single core GHz processor, a 768 MB RAM, 4GB on-board memory and a microSD card slot, Quad Band GSM , 3G, Wi-Fi, Bluetooth and GPS. The BlackBerry Bold Touch is a QWERTY+touchscreen phone with a 2.8-inch capacitive display, a 5MP camera with 720p video recording capabilities, a 1.2GHz single core processor, 768 MB of RAM with 8 GB of on-board memory, Wi-Fi, Bluetooth etc. These specs are still unofficial, so take this with pinch of salt, but we can’t rule out the possibility of this being the final specs sheet for the two devices. We think it’s high time RIM implemented these features onto their devices. It seems like RIM has learnt from their mistakes and are now planning to bring the best onto their devices which is a good sign actually.